Every pretty puppy has a certain amount of grooming that is required to keep the pup in tip-top shape. Some breeds require more effort than others, and in the case of Doodles, it can be confusing since there are variations in Doodles. Curlier coats don’t shed normally at all (or very little if they do) compared to the more open style or hair Doodle coats. Curlier coats are referred to as wool and fleece coats. Coats that are heavier curl and poodle-like are the wool coats. Fleece still refers to curly coats, but this hair is less curl and a lot more wave. What curly coats do is continue to grow! It’s just like our hair, and if you leave it fully alone without any type of trimming, it will grow, and grow, and grow! This is what makes these coats non-shedding. What curlier hair does require is a trip to the groomer for a trim once every 6-8 weeks. You may be able to wait 12 weeks in between visits if you prefer a less trimmed appearance. A groomer will be able to not only trim your Doodle’s hair to a more manageable length, but she will also be responsible for creating “the look” of your Doodle. Ideally, you should provide photos you like of groomed Doodles for the groomer’s reference. 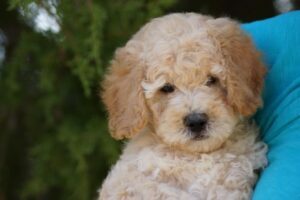 Doodles are often cut into a “teddy bear” or “full face” cut so that their faces are not as close cut as a poodle’s face. These coats should be brushed quite frequently. Ideally, it should be done everyday. Without this brushing, the coat will easily tangle and mat close to the body. Particular care should be taken to brush out the face, behind ears, tails, legs, and under the tummy. These areas are more prone to matting. These coats (often referred to as just hair coats) require less routine professional groomer maintenance. There is some shedding that occurs with them, but the hair typically only grows 1-4 inches in length. Depending on how neat you want your Doodle’s hair to be, one or two groomer visits a year to shape the coat, especially around the face, may be desired. A hair coat doesn’t necessarily have to be brushed everyday, but it should be well brushed 2-3 times a week. This is important to prevent tangling in the hair. Bathing: Too frequent bathing can dry out the dog’s coat and skin as it removes natural oils, but if you suffer from mild allergies, a more routine bath may be required. Otherwise, a monthly bath should suffice for dogs that are fairly clean dogs. If your Doodle tends to be a mud-puppy, your dog would require more baths. Blow Drying: It is not a requirement that you fully blow dry your freshly washed dog, but blow drying (using a blow dryer and brush) tends to straighten out the coat and make it fluffier. It also helps ensure you don’t miss any errant tangles. Ear Care: As dogs with ears that don’t stand upright, special care needs to be taken. A weekly ear wipe out with a paper towel moistened with liquid pet ear cleaner will cut down on oils, wax, and buildup. Only wipe out the portion of the ear you can see! You will also want to wipe the inside of ears dry after a bath or swimming along with applying ear powder to keep them dry. Ears left moist can be a breeding ground for fungus or bacteria and lead to chronic ear issues. Lastly, your Doodle’s ears should have the hair on the inside of the ears clipped or plucked to allow better air flow. Feet: Toenails must be trimmed on a schedule. As a puppy, the toenails will grow very quickly and lightly trimming once every 1-2 weeks keeps them at an appropriate length. When your Doodle is an adult, his nails should be trimmed once every 2-4 weeks. It is important to maintain this schedule because nails left to grow long can damage a dog’s foot. Additionally, Doodles have hair on the bottom of the foot and in between the toes. This hair is best kept short and so should be trimmed at toenail trimming time. Otherwise, this hair often mats into little tangles in between the dog’s pads. Teeth: All dogs should have routine dental care. The ideal recommendation is to brush your dog’s teeth everyday, but if you can brush your dog’s teeth 1-3 times a week, this will greatly help reduce plaque on your dog’s teeth.